This months book, Sock Innovation: Knitting Techniques & Patterns for One-of-a-Kind Socks by Cookie A, is one of the first knitting books I ever bought, and one that I love and continue to use to this day (hence the slightly battered appearance). I started really getting into knitting when I started Uni in 2007 (studying Electronic Engineering). I knit my first pair of socks a year later, from a Knitty pattern (this was in the very early days of Ravelry). They were not a beginners pattern but despite multiple mistakes and poor yarn/needle choice, I finished them on my 20th birthday (and IIRC was late to lectures because I was redoing a too tight cast off). 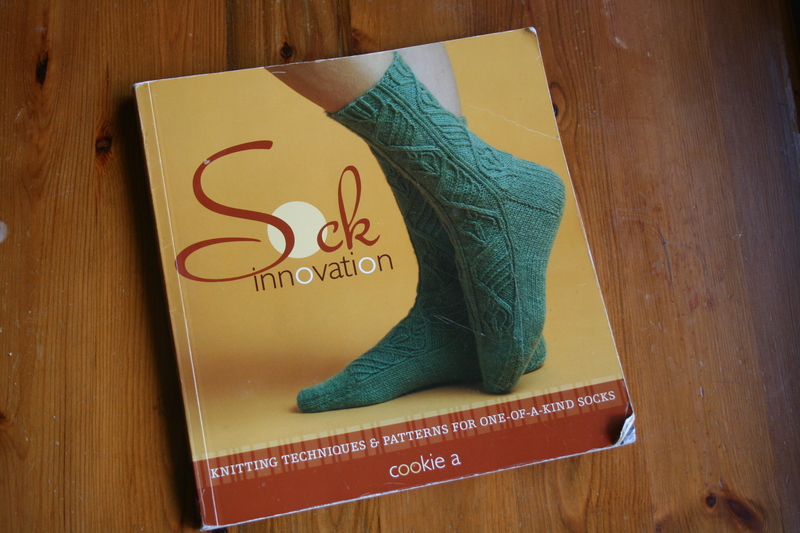 In October 2009 I bought my first sock book, Sock Innovation by Cookie A. I was attracted to the complex designs, but it’s the technique section that has made it one of my favourites. Cookie A is famous for her patterned socks (although I seem to be the only person who has never made a pair of Monkeys) and this book has 15 socks full of lace, cables and texture. They are all named after people and I like the stories of how the socks were inspired by the people they’re named after. Some of my favourites are Vilai, which combines twisted stitches and lace into a very structural design, Cauchy, named after the famous mathematician (and a cat along the way) with a textured zigzag pattern and Kai-Mei with an iconic angled lace panel. 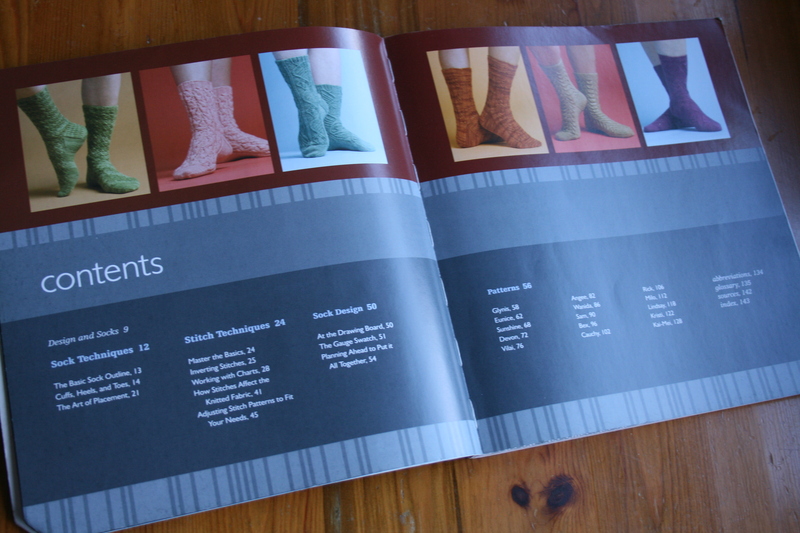 The only socks I’ve ever made from Sock Innovation, however, are probably the most complicated: Bex. I love the three different sections of the pattern, and how they fit together into tessellating hexagons. Then, of course, there is the fact that they’re covered in cables and we know I have a thing for cables. I made my Bex between February and November 2010 (thanks, Ravelry project page). I used Cygnet Truly Wool Rich 4 Ply, as I was still relying on what was sold in John Lewis, a British department store which has never been particularly good for sock yarn, especially if you don’t want multicoloured Regia. It’s a bit fuzzy for cables, really, and produced quite an inflexible fabric. I had progressed to 2.25mm Knit Pro Symphonie DPNs, though, which was a vast improvement over the remnants of my Mum and Grandma’s metal and casein (did you know they used to make needles out of milk?) mismatched UK Size 14 (2mm) DPN collection which I started on. I really enjoyed knitting them, though. The charts were complicated but clear, and I really liked the transitions between different parts of the pattern, such as leg to heel flap, something that has inspired my designing. 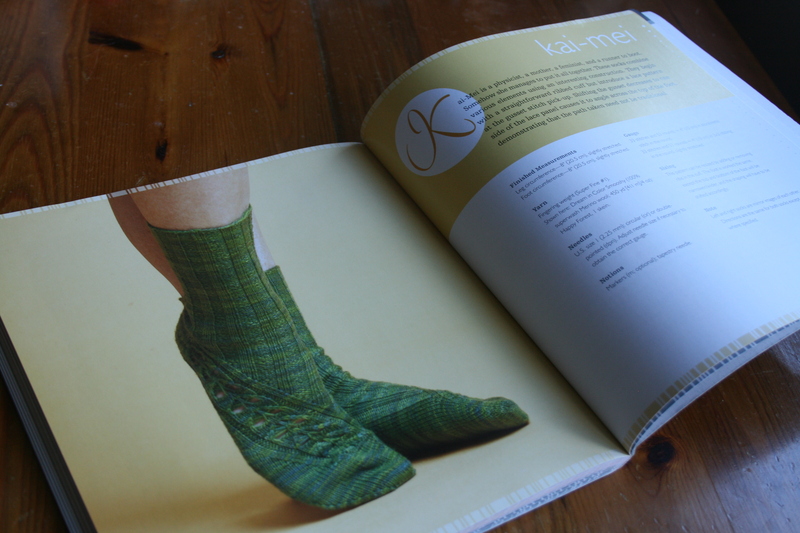 Sock Innovation is a very unusual book, in that as well as giving you patterns to knit, it shows you how to develop your own sock patterns. It has three sections – sock techniques, stitch techniques and sock design. It starts by describing the basic structure of a sock. All the patterns in the book are top down and most feature a flap and gusset heel, so this is what is focused on, although the book does include information on other heel types. One of the most useful things I’ve found is the chart of heel turn numbers for a large range of different stitch counts. Clear photos are included to show the different options. The art of placement is also discussed – how the same pattern can be placed in different ways on a sock for different effects. Stitch techniques covers inverting stitches (going from knit to purl) and mirroring stitches. how to chart stitch patterns to include repeats and converting from working flat to in the round. It also covers how stitches affect the knitted fabric, which ones tend to be wider, or narrower and how elasticity is affected by stitch choice. It then covers adapting stitch patterns and transitioning between different patterns. These techniques are then all pulled together into the final sock design section. This covers the important of gauge swatches (spoilers: very important) and how to put everything together to get a sock you like. I have learnt so much from this book when it comes to what to think about when designing socks, as well as practical tips on how to do it. These are the things that can make a good sock pattern into a great one. I love the patterns, there are some really attractive ones and while the instructions are concise, they give you all the necessary information. There is only one size option (usually 8″ leg circumference) given for each sock, which is a disadvantage, however, some include tips on how to change the sizing yourself. If you like knitting complicated socks, and especially if you’ve ever thought of trying to design your own I would definitely recommend this book. These are affiliate links, I get a small commission if you buy using these links.